Remember to measure your pet for the paw-fect fit. Keep your little one stylish and safe with the OmniPet Plain Leather Dog Collar! 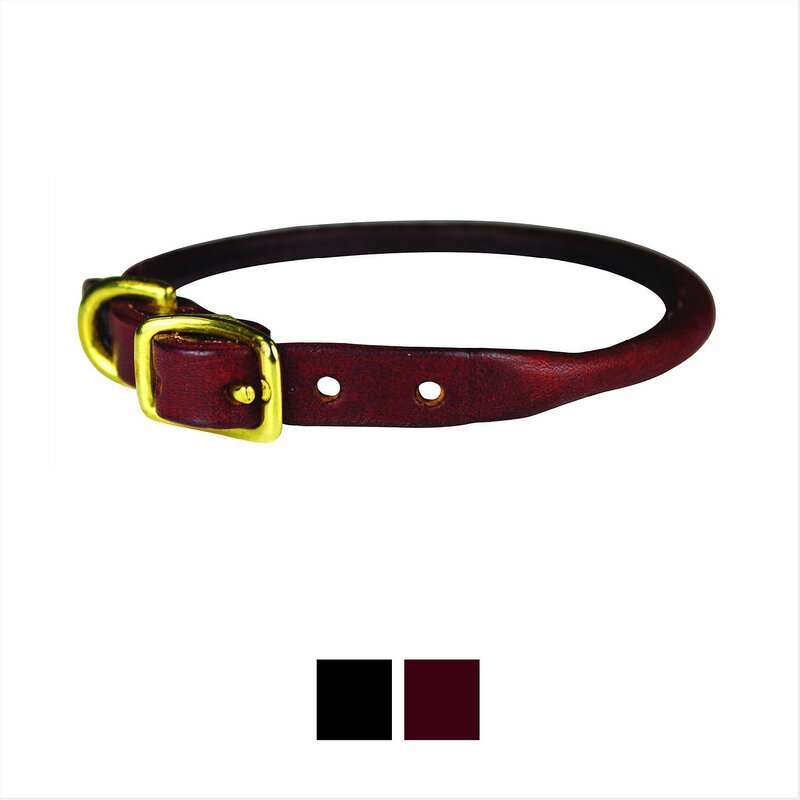 This stylish leather collar features a classy style designed from soft, supple leather. Made with long-lasting and durable materials, this leather dog collar will not only let your pooch stand out from the crowd, it will also last for years! Plus, it’s equipped with durable nickel-plated hardware that will stay securely fastened, no matter how powerful your pooch is. Pair it with the matching OmniPet Latigo Dog Leash and complete the stylish set! The sturdy, beautiful and comfortable design will add style to your pet while walking, training and relaxing. Click here for the OmniPet Round Latigo Leather Dog Leash. This is my Goldendoddle's first "big boy" collar. I am training him to replace my soon to be retired service dog. At 8 mos he is already larger than my Lab service dog. This collar will take him into adulthood. Wouldn't use any other collar on my service dogs! Last collar you’ll have to buy. I bought 4 of these ... one for each of my kids. They are the perfect size for small dogs and soft so comfortable. Size is as stated... no problem with sizing if you measure the neck. Great for Golden Retrievers. No more itching or scratching trying to get it off. My dogs have 17.5 inch necks and 22 fits perfect. They finally love their collars. I have a long haired, double coated dog who is very active and tries his hardest to get his beautiful fur matted. I find that flat collars exacerbate the process. This rolled collar does not break or dent his fur. He doesn't get matting under this collar, so our daily brush has gotten much easier! It's nothing fancy, but it's a good price. The rolled collar has fallen out of favor, but is a comfortable collar for dogs. This collar is well-made with quality leather and stitching. The hardware and fittings are first-class. I would recommend this collar to anyone with a medium- to long-haired dog; it reduces the matting that often accompanies flat collars. I bought this rolled leather collar for my Labrador Retriever and I really like it on her. The quality is very nice. The buckle is a nice weight and not flimsy at all. One thing I really like is its thiner width from a traditional nylon collar. I would definitely order it again and recommend it to anyone looking for a high end leather collar. We have a one year old Tibetan Terrier who has a thick coat of hair. This collar was recommended to me by a local pet store that did't carry it. We had been using a regular collar on him but had problems with the hair matting beneath it. This is what you need if your dog has a long coat. This is our second collar. He outgrew the first one. The old one is still in good condition. Highly recommend. Will buy again if need one. I am a fan of leather, the rolled collar is great as it prevents matted hair and rubbing. They fit proper on the neck as well if ordered in the correct size. I have bought 3 so far and just ordered 3 more. Love they are made in the USA too~! Have not seen bleeding of the leather when wet. Overall awesome collar that will last forever and get softer as it ages.